The rain from last night and most of today has thankfully filled up our water tank. No more trips to the burn with the watering-can for us now. A little wander around the garden when the sun came out, because it does look so much more appealing after a bout of showers, lead to this find. The shape of the leaves leads us to the conclusion that it is a rowan tree which we think is a good omen after our neighbour once dissuaded us about a fallen rowan tree which we had had our eyes on for the wood burner, saying that to burn it would bring us bad luck. 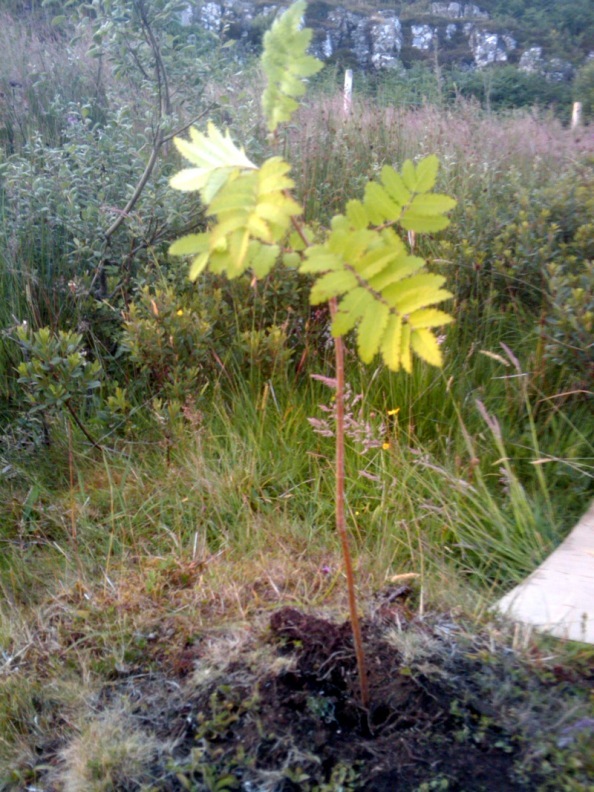 It wasn’t until a year later that the importance of the rowan tree would crop up again. This time, we heard about a wedding ceremony taking place underneath a particular rowan tree that had grown on top of an oak, an epiphyte or ‘flying rowan’, that is especially potent in warding off evil spirits, that we started thinking about the relevance of the tree to Scottish mythology. They are everywhere up here although it isn’t until the Autumn when their bright red berries appear, that you start to notice just how many. If you spot one in a graveyard, its presence is probably not a coincidence as they are planted by loved ones of the deceased to prevent any hauntings. Rowan is still used in the craft of stick-making, that is still taught at our local village hall, even if the mythical properties behind its use in the past by druids might not always be known. We’ve yet to see our local farmer put a sprig of rowan above his barn door to protect his cattle from harm although we might suggest it only if we see him down the pub and have had a few drinks first. If you’re in the Loch Lomond area and fancy a walk then you might be interested in this.